Please refer to our stock # TD00193 when inquiring. A design of a green cross with all sides equal enclosed in a rectangle on one point with red steps and green saw teeth in rows and columns of five against a background of light and dark blue checked fabric. 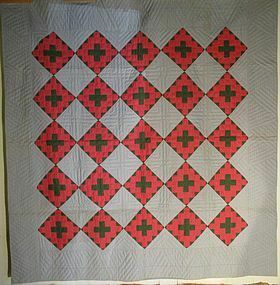 Geometric quilting of waves around the outside and rectangular quilting in the other light squares. Great printed cotton backing. Condition: May never have been washed as the blue chalk lines for the quilting are still visible. There is a stain near the border.